The Department of Geography is now offering Geography Student Fieldwork Grants. The purpose of such grants will be to provide financial support for students pursuing fieldwork related to undergraduate Senior Assignment research or graduate student thesis/non-thesis (applied) research. To learn more please click here. Each Spring the Department recognizes superior students at Honor's Day with the following awards. To see a list of previous award and scholarship recipients please click here. Given to the graduating senior who has a high GPA and participates in campus activities. Given to a student with a strong grade point average in Geography or Sociology, and one who will be able to make a strong contribution to the fields of Geography or Sociology. Given to a graduate student who demonstrates outstanding achievement. Given to an undergraduate Geography major with high academic achievement. Given to a geography major who has demonstrated exemplary leadership in his or her graduating class. Given to an outstanding student studying Earth Science. The Gloria Man-wai Cheung So Award in Geography was generously established by the family of Gloria So (MS Geography, 1986). The student selected to receive this award is determined by a committee appointed by the Chair of Geography. Preference is given to international students, especially those from China and Asia, however the award is open to all students. Given to the top student in Geographic Education who is entering the teaching field. The Noble R. Thompson, III Student Award in Geography was established through donations to a fund established to celebrate his commitment to geography and geographic education. 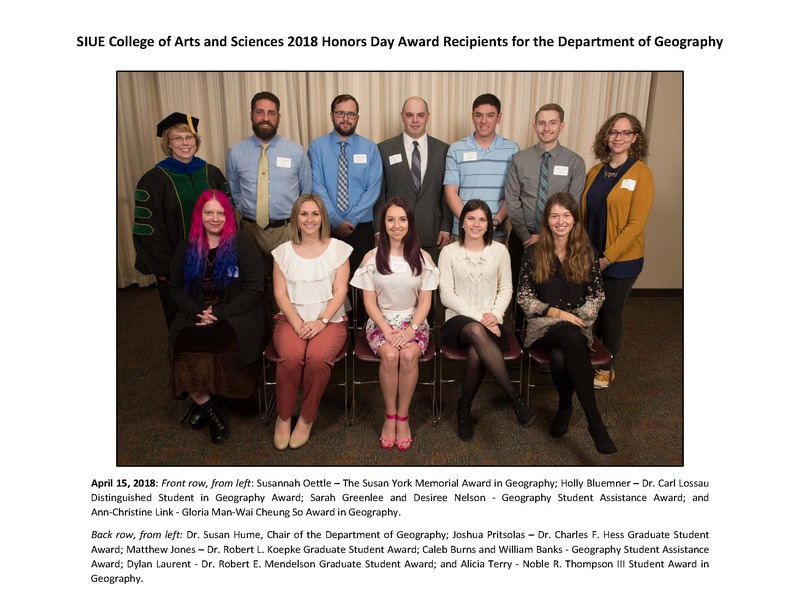 The undergraduate or graduate student(s) selected to receive the award exemplify in some way Noble's ideals, character, and commitment to geography. Given to an outstanding student in Geography. The Office of Student Financial Aid administers several federal, state, and institutional financial aid programs including scholarships, grants and loans. Early application is advised.